Members of the public ride the MRT Jakarta on March 12, 2019, the first day of the trial run for the new mass transit system. 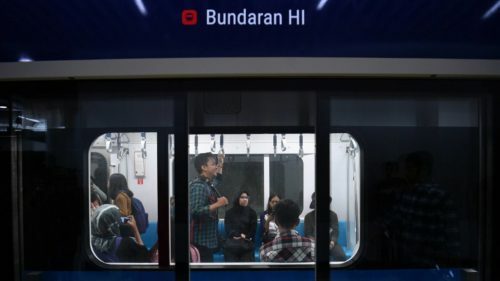 President Joko "Jokowi" Widodo is scheduled to inaugurate the country's first MRT on Sunday, an official from city-owned transportation company PT MRT Jakarta has said. In a meeting with City Council Commission C overseeing financial affairs on Monday, MRT Jakarta finance director Tuhiyat said the inauguration would be held at the final station of the inaugural line at Central Jakarta's Hotel Indonesia traffic circle. "[Provided that] there are no obstacles, on Sunday, March 24, [MRT Jakarta] will be inaugurated by Jokowi," said Tuhiyat, and that the new rail service will commence commercial operations on April 1. Phase 1 of the MRT Jakarta project, which is scheduled for completion this month, covers the construction of 13 stations along a 15.7-kilometer route from Lebak Bulus terminal in South Jakarta to the Hotel Indonesia traffic circle. Tuhiyat added that the president and Cabinet ministers would join the MRT trial run on Tuesday, ahead of Sunday's inauguration.